Nowadays the application of robots are emerging in areas of modern life. It is expected we will be living in a new era in which robots such as socially interactive robots will make an important effect on our daily lives. Considering emotions play a critical role in human social communication, emotional episodes are necessary for human-robot social interactions. 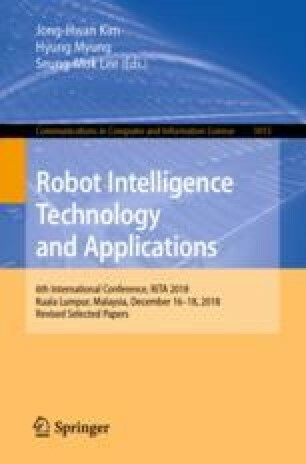 In this regard, we propose a framework that can form a social relationship between human and robot using an emotional episodic memory. Proposed framework enables personalized social interactions with each user by identifying the user and retrieving the matching episode in the memory. The interaction is not fixed, the emotional episodic memory is developmental through additional experiences with the user. The proposed framework is applied to an interactive humanoid robot platform, named Mybot to verify the effectiveness. As demonstration scenarios, photo shooting, and user identification and robot’s emotional reactions are used. This work was supported by the National Research Foundation of Korea (NRF) grant funded by the Korea government (MSIT) (No. NRF-2017R1A2A1A17069837). For the hardware design, we developed a humanoid type robotic platform aiming at sufficient interaction with humans. 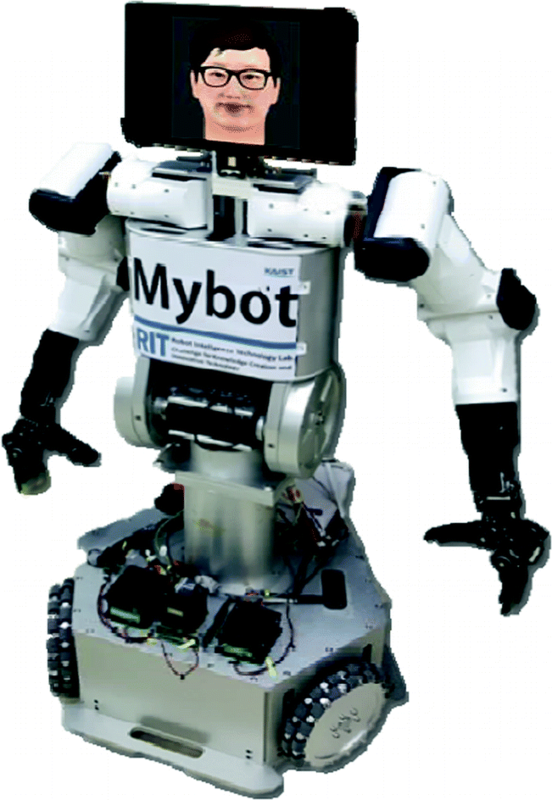 The hardware robot is named Mybot, developed in the RIT Laboratory at KAIST (Fig. 6). Mybot, the interactive robotic hardware platform. Mybot has an upper body including two arms (10DoFs for each arm) and one trunk (2DoFs), and a lower body including an omnidirectional wheel and power supply as shown in Fig. 6. It is running on Linux 16.04 operating system and controlled by an Odroid. The body is connected to the robotic head via TCP/IP communication. Tablet PC was used for robotic head which function as image receiver, voice detection, touch detection in our experiment since it has various input sensors and output interfaces. Especially for the touch detection module, the touch sensor on the tablet PC recognizes mouse clicks and mouse movements as the touch input, mouse movements are tightly restricted during the experiment. A tablet computer with Windows10 64bits OS, i5 6th CPU, 8G RAM is used, and it has 12.3″ 2763 * 1824 resolution display with touchable screen. The device also has a 5 M pixels front camera, a microphone, and a speaker equipped. For the neck frame, 3 actuators are used for 3 DOFs motion: pan, tilt, and yaw of the robotic head. The actuators are ROBOTIS MX-64R motors that operate at 15 V and have around 80 RPM speed and 80 kg * cm stall torque. The actuators are connected to the robotic head (tablet) via USB to Dynamixel interface. For the software design, our team used visual C++ MFC programming to implement the proposed framework. As we had to use some cloud application in recognition part and language part, we used socket server and socket client to access to the API. We used Internet access to 4 cloud applications to give the framework functionality. Face detection module uses OpenCV libraries with the Haar Cascades method. The user face identification module classifies user’s face so the robot can identifies which user is interacting with. For the identification algorithm, ARTMAP is applied, which is a supervised learning version of Adaptive Resonance Theory (ART) network . The reason for applying ARTMAP is that facial learning and recognition should be conducted in real time, and feasible performance can be achieved even with small number of samples. More technically, the robot takes a 640 × 360 image, and crops and resizes the image in the range where the user’s face is located. Then, the image is vectorized in one dimensional vector, and used as the input vector of ARTMAP. The result video of the user identification in real time is available at https://youtu.be/Ik_FwL2WYK8. The facial expression recognition module recognizes user’s facial expression. The module uses Google Cloud Vision which provides recognition API for four human emotions: joy, sorrow, anger, and surprise; and with four levels: very unlikely, unlikely, likely, and very likely. The advantage of Google Cloud Vision is that it is available for any user face. Speech recognition module uses Google Speech to Text cloud application which has the function of converting the speech of a user into a text file. Additionally, it supports multi-lingual recognition services including Korean language service with the state-of-the-art performance. Social relationships cannot develop or sustain without daily conversation. Thus, dialogue generator module takes text data from the speech recognition module and delivers the text to Yally’s Natural Conversation cloud application (http://www.yally.com/en/), and gets answer text from it. The generated answers are everyday life conversation rather than specific conversation. Text to speech synthesizer module uses Naver Text to Speech cloud application (Clova Speech Synthesis). This module is directly linked to the Lip Sync. module in the communication part, so it signals when the lip synchronization should start.